Phoenix, AZ (December 7, 2015): David Weekley Homes hosted a company-wide Thanksgiving Drive and collected more than 100,000 pounds of turkey and nonperishable items. In Phoenix, the Thanksgiving Drive benefited Save the Family, a nonprofit organization that provides transitional housing and support services to families with children to help conquer homelessness. 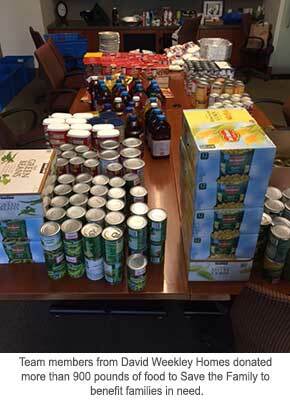 Nearly 900 pounds of food was collected during the two-week drive. Phoenix team members delivered the food items to the organization to distribute to families in time for the holiday. "Save the Family is so grateful for the support of David Weekly Homes," said Jacki Taylor, CEO of Save the Family. "Because of their generosity, hundreds of children from homeless, low-income and veteran families from around the Valley will receive much needed support this holiday season." The David Weekley Family Foundation also donated $5,000 to benefit the local charity. The drive was an initiative of the company’s CARE program, which is a charitable and volunteer program that joins team members with homeowners, homebuyers, community partners and local nonprofit organizations to live out its purpose, Building Dreams, Enhancing Lives in all the communities in which it builds. This is accomplished by company team members volunteering countless hours to different organizations in their communities and by The David Weekley Family Foundation donating more than $100 million to a variety of organizations throughout the U.S. and abroad over the past 20 years. David Weekley Homes, founded in 1976, is headquartered in Houston and operates in 22 cities across the United States. David Weekley Homes was the first builder in the United States to be awarded the Triple Crown of American Home Building, an honor which includes “America’s Best Builder,” “National Housing Quality Award” and “National Builder of the Year.” Weekley has also appeared nine times on FORTUNE magazine’s “100 Best Companies to Work For®” list. Since inception, David Weekley Homes has closed more than 80,000 homes. For more information about David Weekley Homes, please visit the company’s website at www.davidweekleyhomes.com.